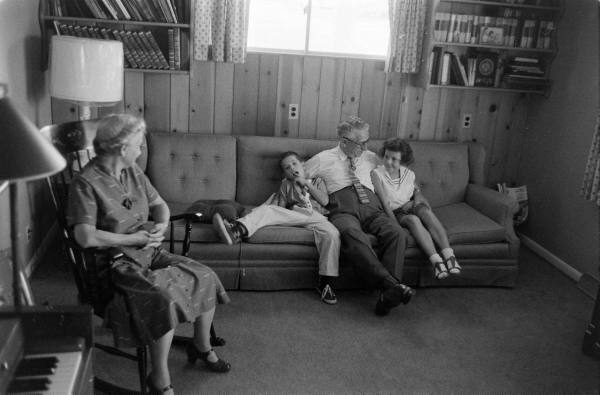 Retired man with family, 1959. Photograph by Stan Wayman for LIFE magazine. ©Time Inc.
An aspiring memoirist seeking famous writers’ letters and essays for motivation receives an inspired list of book recommendations. I can almost guarantee you’ll find something new to you and revelatory on the list. “If you answer a few interesting questions while you still draw breath, you will leave a gift of inestimable value to those who come after you,” writes Alison Taylor of Utah-based Pictures and Stories. A reissue of Ntozake Shange’s If I Can Cook/You Know God Can (Beacon Press, 2019) prompts LitHub to share this deliciously personal excerpt. The book’s subtitle, “African American Food Memories, Meditations, and Recipes” merely hints at the rich and eclectic content within, a tribute to food as a people’s living legacy. “The internet is making paper recipes obsolete, but many modern cooks see the cards as tangible mementos of favorite foods and the beloved cooks who made them over and over again.” Frayed edges and oil stains? All the better. Susan Hood of Remarkable Life Memoirs in New York shares a handful of handwritten letters she revisited among her parents’ things, feeling reconnected to them and gleaning a bit of family history along the way. We all know how photos and family heirlooms tell stories, but what about objects as mundane as bakeware? Are there simple objects that reflect significant truths about who you are?, asks Massachusetts–based personal historian Nancy West. You needn’t travel to Utah to benefit from the family history event of the year, RootsTech. Discover how you can learn about storytelling, interviewing, and genealogy from the comfort of your own home. Urban Archive invites New Yorkers to submit photos for their new crowdsourced history project. Familygenealogy.online launched tools and resources for exploring family trees. HippoCamp, a conference in PA for creative nonfiction writers, has opened early-bird registration.